A recent field trip to a local Apple Orchard -Curtis Orchard- reminded this farm girl to Bee thankful for the wonders of Mother Nature. The family at Curtis Orchard not only sell their products-apples, pumpkins, and honey- raised on the 80 acre farm but other products from nearby farmers.The Curtis Orchard’s History is rich with family traditions and still owned and operated proudly by family members. 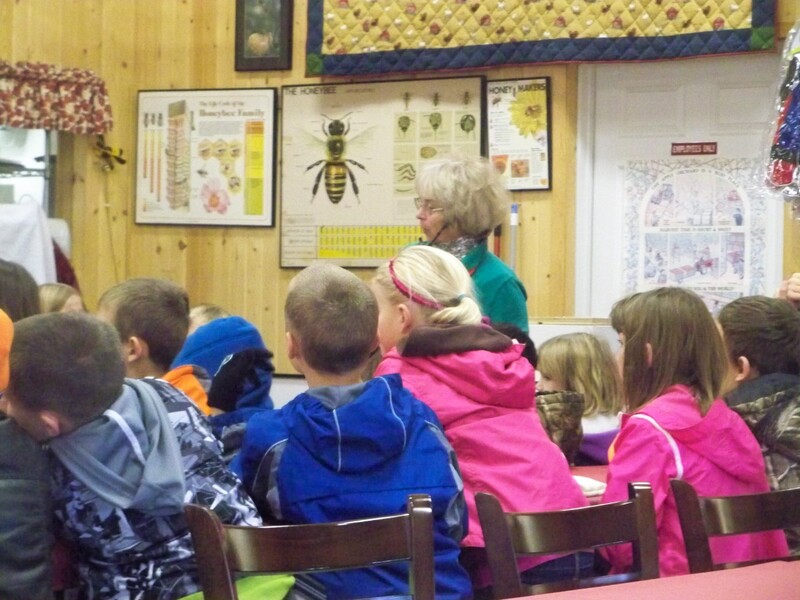 On this field trip, classmates of my son started the behind the scene tour with a lively discussion about bees and the jobs they perform for the farm. For you see the bees are the only workers on the farm that is not receiving a paycheck. The Girl Bees, Worker Bees, do all the work collecting the Pollen, feed the Queen and other bees, and guard the hive. There is one Queen Bee who lays 2000 eggs a day and never leaves the hive. The bees are the only workers on the Orchard that are NOT paid. When more eggs to produce Queens are laid, the current Queen uses her stinger to kill 4/5 eggs. The remaining new Queen Bee and the current Queen fight to death. The Strongest survives. The 60,000 or so bees in a beehive may collectively travel as much as 55,000 miles and visit more than two million flowers to gather enough nectar to make just a pound of honey! Honey is a natural sweetener and contains a variety of flavonoids and phenolic acids, which act as antioxidants, scavenging and eliminating free radicals. Honey is used in a variety of beauty products. It is a humectant, which means it attracts and retains moisture-great for shampoos, cleansers, lotions, and conditioners. Honey has antimicrobial properties. Most bacteria and other microorganisms cannot grow or reproduce in honey. Therefore Honey does not go Bad. Since Honey has the antimicrobial properties, it has been used as medicine. It was found in King Tut’s Tomb. In practical sense, honey can be used as ointment as tropical treatment to a wound. It also has been found to reduce scarring. Honey is a natural cough suppressant. Visit the National Honey Board’s Website for great recipes using Honey, Beauty Recipes, and great info on Honey.